Born in California in 1912, Julia Child enlisted in the Army and met her future husband, Paul, during World War II. She discovered her love of French food while stationed in Paris and enrolled in Le Cordon Bleu cooking school after her service. Child knew that Americans would love French food as much as she did, so she wrote"Mastering the Art of French Cooking" in 1961. The book was a success and the public wanted more. America fell in love with Julia Child. Her TV show, "The French Chef," premiered in 1963 and brought the bubbling and lovable chef into millions of homes. 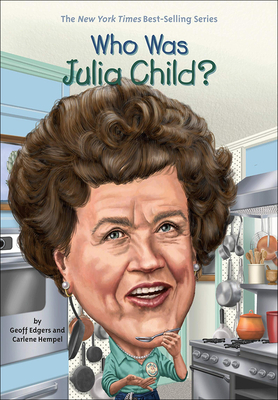 Find out more about this beloved chef, author, and TV personality in"Who Was Julia Child? Geoff Edgers is a reporter at"The Boston Globe"and author of"Who Were The Beatles? "and"Who Is Stan Lee?" Carlene Hempel a lecturer at Northeastern University's School of Journalism."